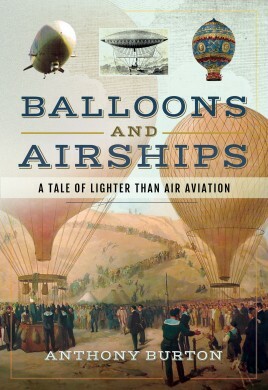 This book tells the often dramatic and always fascinating story of flight in lighter than air machines. This book tells the often dramatic and always fascinating story of flight in lighter than air machines. For centuries man had dreamed of flying, but all attempts failed, until in 1782 the Montgolfier brothers constructed the world’s first hot air balloon The following year saw the first ascent with aeronauts – not human beings but a sheep, a duck and a cockerel. But it was not long before men and women too took to the air and became ever more adventurous. The aeronauts became famous giving displays before crowds of thousands, often accompanied by special effects. In the early years, ballooning was a popular pastime, but in the 19th century it found a new use with the military. Balloons were used to send messages out during the Siege of Paris and later found a role as observation balloons for the artillery. But their use was always limited by the fact that they were at the mercy of the wind. There were numerous attempts at steering balloons, and various attempts were made to power them but it was the arrival of the internal combustion engine that saw the balloon transformed into the airship. The most famous developer of airships was Graf von Zeppelin and the book tells the story of the use of his airships in both peacetime and at war. There were epic adventures including flights over the poles and for a time, commercial airships flourished – then came the disaster of the Hindenburg. Airships still fly today and ballooning has become a hugely popular pastime. Anthony Burton is a professional writer who has specialised in industrial and transport history. Among his many books on the subject are a biography of the pioneer of steam transport, Richard Trevithick, and an account of a journey in search of all types of steam, Steaming Through Britain. He has also worked on many TV documentaries, including a ninety-minute film on the Great Dorset Steam Fair, which he wrote and presented for Channel 4. In his spare time he helps maintain and run a stationary steam engine in a former woollen mill.